This book is kind of stupid. It’s a mess of tropes and clichés liberally borrowed from the early Zelda and Final Fantasy games written in a style aimed at the lowest common denominator. There is no depth to the story, the characters, or the writing. Witches’ Forest is a light novel, and it reads like a light novel: shallow, superficial, and disposable by design. 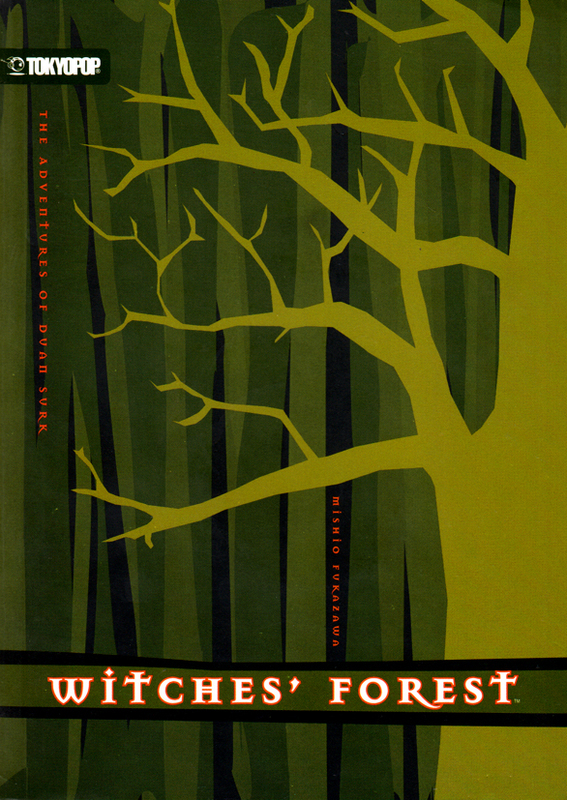 Nonetheless, I think Witches’ Forest is an interesting and important book, especially in translation. Before I explain why, allow me to give a brief plot summary. Duan Surk is an orphan in a world plagued not only by vicious man-eating monsters but also by war. He was raised in a small town by his brother Gaeley, a hale young man who took on various odd jobs to order to be able to provide medicine and care for the sickly Duan. The young Duan makes up for his lack of physical strength with an inquisitive mind; and, by the time he is fourteen, Gaeley is confident enough in Duan’s ability to make it in the world that he himself decides to leave the town in order to become a soldier. Gaeley is everything to Duan, so the young Duan decides to become a fighter like his brother. Duan fails the physical portion of the initial test of the Adventurer’s Club guild, but the army will take anyone, so off to the army he goes. After spending a year as a cook’s assistant, Duan returns to camp after spending the day gathering ingredients only to find his entire battalion vanished into thin air, leaving only empty tents and smoldering fires behind. He straps on a sword and rushes into a nearby forest with a vague plan of rescue in mind, but the forest is enchanted, and Duan soon finds himself hungry, lost, and in dire peril. This is where we find our hero at the beginning of Witches’ Forest, but Duan soon stumbles upon two traveling companions: Olba October, a battle-hardened veteran adventurer in his twenties, and Agnis R. Link, a sixteen-year-old sorcerer with a penchant for fire magic who may or may not be a princess in disguise. Both of these characters are trying to get to the mansion at the heart of the forest, wherein two witches are said to dwell. Olba wants treasure, and Agnis wants revenge. Before they can reach the witches, however, they must brave the dangers of the surrounding forest and the traps set up in and around the house itself. The adventures of the trio are solidly structured upon a foundation of RPG tropes and gameplay mechanics. Agnis is the perky refugee, Olba is the jaded older guy, and Duan is just about every main player-protagonist to ever appear in a JRPG. The characters randomly encounter monsters drawn directly from D&D dungeon master guides, and they earn experience points when they defeat these monsters. Their Adventurer Cards keep track of their experience points, and, when they earn enough, they gain a level. They are equipped with a full arsenal of Zelda items, from the port-o-lant (which “uses low-cost solid fuel made of Zora oil”) to the coily coily rope (“the definitive version of the hooked rope”), and Agnis in particular has to worry about running out of MP (“magic points,” or magical energy). The trio is accompanied by a flying baby dragon/fire lizard that can talk and use low-level healing spells and is somehow fuzzy despite being reptilian. The only thing the party doesn’t have is a bag of holding, as they’re constantly lugging their adventure gear around with them and getting into petty arguments over who has to carry what. One of the most engaging parts of Witches’ Forest is Agnis’s backstory, which involves a heartbroken yet politically ambitious stepmother who sinks to Cersei Lannister depths of dastardly scheming. Within this family drama, characters change and grow and are faced with problems that have no obvious solutions. For the most part, though, the novel focuses on the three main characters running around and hitting things with swords and spells. Each of these battles requires some minor element of strategy but is relatively brief. Sentences are short and declarative. Each paragraph contains about three to six sentences. There are no anime-style illustrations, but the text is interspersed with various material drawn from its fantasy world, such as copies of the characters’ Adventurer Cards, advertisements for magical items, and overworld and dungeon maps. At the end of the book is a three-page bestiary of monsters that appear in the story, which is illustrated in a style highly reminiscent of mid-1990s fantasy anime like Record of the Lodoss War or Magic Knight Rayearth. Witches’ Forest feels extremely dated, which makes sense, as popular culture has moved on in the almost twenty years since the book first came out in 1996. What makes the novel interesting is that it captures the spirit of its age so well. Neon Genesis Evangelion aired during the fall season of 1995 and ended up drastically changing the playing field; but, before that, many popular anime for the young adult demographic were based on light novels such as Slayers and Irresponsible Captain Tylor, which are just as goofy as they are epic. The humor, the fighting, the yelling, the zany adventures, and the group of ridiculously disorganized young people resolving volatile political stalemates entirely by accident are all strongly reminiscent of the anime of the time. It goes without saying that all of this media is closely connected to the themes and stylistic conventions of video games before they made the leap to the 32-bit era. In this way, Witches’ Forest is like a time capsule from a bygone era. Tokyopop’s release of this book in translation also calls to mind the cultural atmosphere in the United States of a little less than ten years ago. Excitement over Japanese entertainment media such as anime, manga, and video games was almost visibly swelling as new anime conventions popped up every year and bookstores devoted an ever-increasing amount of shelf space to manga. The spark of interest in young adult fiction kindled by the Harry Potter books had leaped into a blazing inferno with the sudden popularity of the Twilight series, and the teenage demographic was on fire in terms of marketing value. Tokyopop was licensing one manga series after another, Viz Media was using its profits as capital to test new markets, and even the mighty Hachette Publishing Group was launching a new imprint devoted to all things manga. Tokyopop had begun to translate light novels, and certain titles, such as Yoshida Sunao’s Trinity Blood series and Ono Fuyumi’s Twelve Kingdoms series, were proving popular with crossover audiences. 2006, the year that Witches’ Forest was published in translation, was the absolute peak of the anime and manga industry in the United States (at least in terms of sales numbers). The market was diversifying and had the support of major retail chains, complaints about internet piracy and entitled fans were few and far between, and it seemed as if anything was possible. As I wrote at the beginning of this review, Witches’ Forest isn’t written for those seeking a multilayered story, beautiful language, or thematic and allusive depth. Instead, it’s meant to be a quick and enjoyable read, and it serves its purpose admirably. As such, it’s a perfect representative of the literary medium of light novels. The market for light novels in Japan is relatively large, so books like the Duan Surk series, which aren’t particularly brilliant or original, can still thrive and reach a large audience. In the United States, however, the publishing market is tough and the market for young adult novels in translation is infinitely tougher. The crazy manga boom of the last decade was thus necessary for something like Witches’ Forest to appear on bookstore shelves. Witches’ Forest is therefore an interesting cultural artifact that serves as a window into both the Japan of the 1990s and the United States of the 2000s. Its value as a tangible index of pop lit history aside, the novel is a lot of fun to read, especially for fans of video games and anime. For an older readers, the experience of reading the book may evoke a certain sense of nostalgia, while a younger reader might be able to enjoy the “what was old is new again” thrill of encountering tropes and narrative patterns that now fall slightly outside of the mainstream. There are four books in the Duan Surk series, and all of them are available in English translation from Tokyopop. Although used copies can be found through various distributors, the best way to get your hands on new copies of all of the books in the series is through the anime retailer The Right Stuf, which is a treasure trove of out-of-print light novels in translation. If you’re interested in the history of anime as it unfolded from year to year, please check out the blog The Golden Ani-Versary of Anime, on which a host of anime bloggers has chronicled every year from 1963 to 2012. The blog’s point-of-view bias is fairly strongly male, but it’s still a cool project and definitely worth checking out. For more on the recent history of the manga industry in the United States, I highly recommend the book Manga: Introductions, Challenges, and Best Practices, which is short, readable, and extremely well-edited and well-organized. It seems a kind of interesting. In my country (Czech) there are not many books by japanese authors, only Kawabata, Oe, Murakami (both of them), Kirino and Tsutsui. So I have to read books in english. I am loooking for some fantasy book… By the way, I have discovered this site today and it is just awesome!